Remember I told you a couple of weeks ago that Alex Downie and Tim Craine were in town? Well, their work here went very well indeed. Working with another familiar face on this blog, Chris Stott of ManSat and his team, the Isle of Man’s space race ambitions have received a big boost. 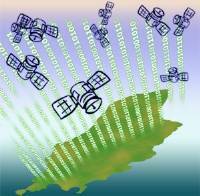 Three of the world’s top satellite operators have confirmed they are to join the Isle of Man-based Space Data Association. The Washington Conference at National Harbor was huge, with over 9,000 delegates. And during it, three major satellite players, Telesat, Eutelsat and GE Sat came on board the SDA. In November last year, the global — and huge — satellite operators SES S.A. Intelsat Ltd and Inmarsat plc, together with Island-based ManSat, announced they had founded the Space Data Association (SDA). The announcement was a highlight of the Satellite 2010 conference that took place in Washington DC this month. Some 9,000 business leaders and industry professionals from around the world attended the event. The Manx delegation comprised of Alex Downie MLC, Treasury member with responsibility for space, Tim Craine, Director of Space Commerce, ManSat chairman and CEO Chris Stott, ManSat finance director Ian Jarritt and Greg Jones, partner with KPMG.